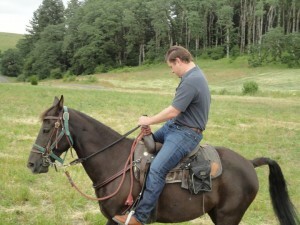 You have probably arrived at a winery in a car or in a limo, but have you ever trotted up on horseback? The next time you find yourselves in the rolling Red Hills of Dundee, Oregon for wine sampling, grab a set of Tennessee Walking reins and fall in line for an equestrian oenophile adventure. 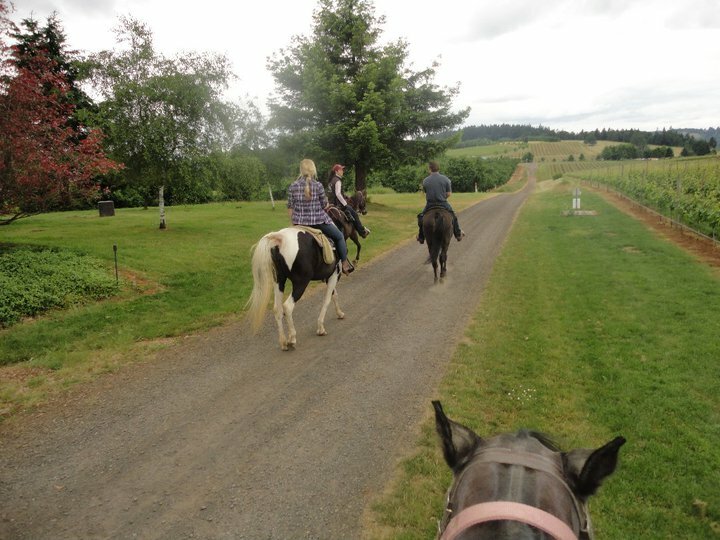 Equestrian Wine Tours has been galloping through vineyards in Dundee for approximately five years, and a few weeks ago, I was lucky enough to be along for the ride with three friends of mine. We had envisioned a biking tour of the wineries in the area, but the July 4th holiday threw a wrench in our giddy-up, and we were forced to come up with plan B. After a quick Google search for “alternative wine tours” and “Portland,” I was led to the Equestrian Wine Tours website. We met Jake and Shirley Price, the owners of Equestrian Wine Tours, at Wine Country Farm, a bed and breakfast that doubles as a vineyard and winery, which they use as the starting point for the tours. After a short introduction to our four Tennessee walking horses and a jaunt around the warm-up ring, we were saddled up and ready for the first leg of our journey, led by our guide Sarah. Single file, we meandered up through verdant vines, attempting (sometimes in vain) to stop our horses from snacking on the leaves. With limited space between the rows, you can imagine how this sometimes was a challenge. We wound up a hill and onto a road, on our way to White Rose Estate. White Rose Estate has a gorgeous copper clad tasting room set high atop a perfectly manicured hill. The adjacent property is the former home of Eyrie Vineyards, often credited as being the founding vineyard in the region. The late David Lett, founder of Eyrie Vineyards, was affectionately known as “Papa Pinot,” giving credence to the rumor that this was the first place pinot noir grapes were grown in the region. To be fair, it is unclear who planted first at this location, but we can give Eyrie credit for being the first vineyard and winery in the Dundee Hills, dating back to 1965. Talk about a cool neighbor! White Rose Estate’s wines would have made “Papa Pinot” proud. 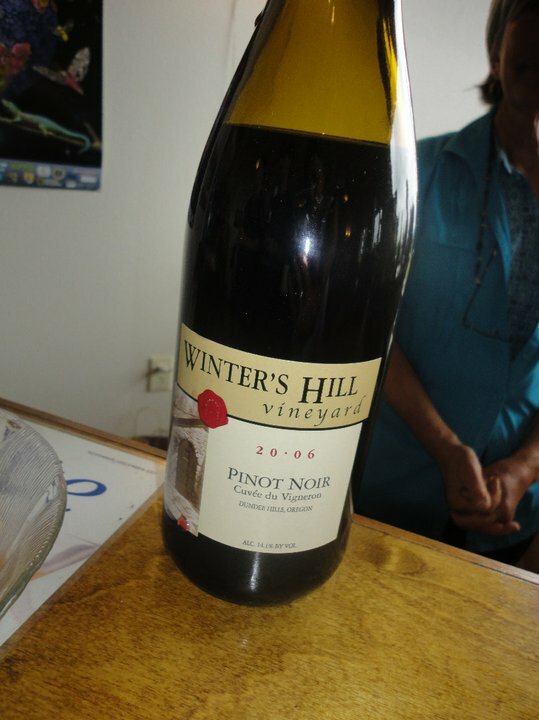 We sampled four different 2008 Pinot Noirs—the White Rose Estate Dundee Hills AVA, the Dragon’s Bluff Volcanic Rock Select, the Dragon’s Bluff North Valley Reserve, and the White Rose Estate Sovarae. Each was a full-bodied and delicious representative of the variety, and as we sampled each of these flavorful wines, our horses enjoyed a bit of respite from the blazing sun beneath the trees outside. As we finished up at White Rose Estate, we mounted our horses and headed back down a hill towards a grove of hazelnut trees. Our guide spoke about the rich flavors of the raw nuts, and I am sure my horse, Spotlight, grabbed herself one as we rode through the trees, giving new meaning to the term “fast food.” Things did get a bit interesting as we continued further down the hill. A note on horse riding: shiny horseshoes and dry brush can lead to slick conditions. My boyfriend would learn this the hard way, as his horse lost her footing and her back legs slid out from under her. Fortunately, she set him down without incident and they both hopped right back up so we could continue our ride towards Winter’s Hill Vineyard. Winter’s Hill was a charming little winery whose team clearly believes in the farm-to-table movement. In addition to our tastings, we were offered those delicious hazelnuts Sarah had talked so much about, a salmon pâté, and unfiltered grape juice. Additionally, I purchased a small jar of clover honey for my father and a larger bottle of pumpkin honey for myself. All of these products came from neighboring farms, fishermen, and monks, believe it or not. The tasting here was a mixture of whites and reds, but each sip seemed more like a bite; Delphine Gladhart, Winter’s Hill’s French-born winemaker, has a knack for blending and selecting vibrant fruit. To make things even better we were treated to her version of Provençal rosé as well. We spent a short moment chatting with the winemaker before we all mounted up for our next destination. As we went to leave, we passed by Jake Price’s gorgeous draft horse, hitched up to an antique black cart outside the tasting room. 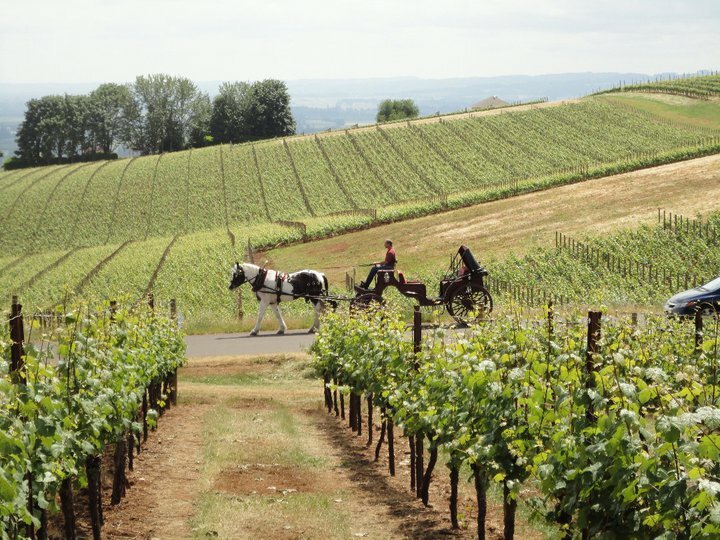 Equestrian Wine Tours also offer cart rides through the vineyards, which can be booked per couple and as a wedding package. We finished our tour where we started, at the riding ring at Wine Country Farm. There, we dismounted, fed our horses a few treats, and headed inside to imbibe one last time in the B&B’s tasting room. 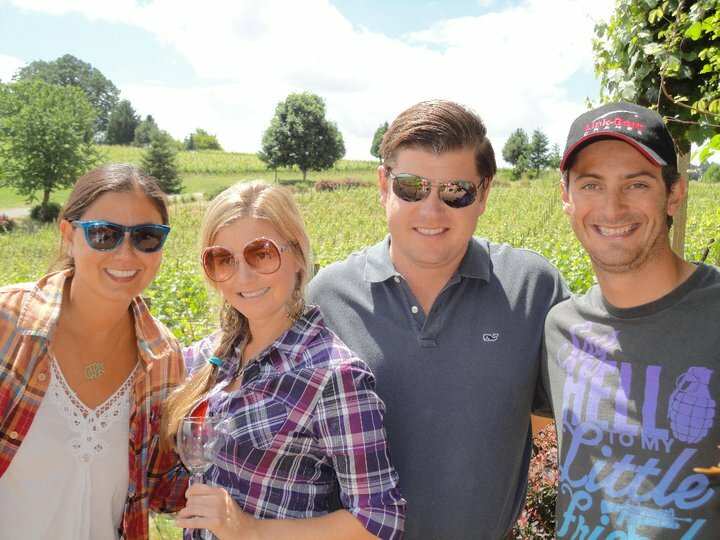 We sampled from a large flight of wines there, including two Chardonnays and Pinot Noirs from different vintages. It was a great opportunity to compare and contrast their flavors, and the wine hostess was nothing short of effervescent and enthusiastic in helping us understand their brand. Unfortunately, we had to forgo a lovely picnic-style lunch that Shirley prepares herself, as our schedule did not permit it. The lunch can be added to the horseback riding tour though for a nominal fee, and the longer ride also includes a visit to an additional winery, which is reason enough for me to return for ride number two. 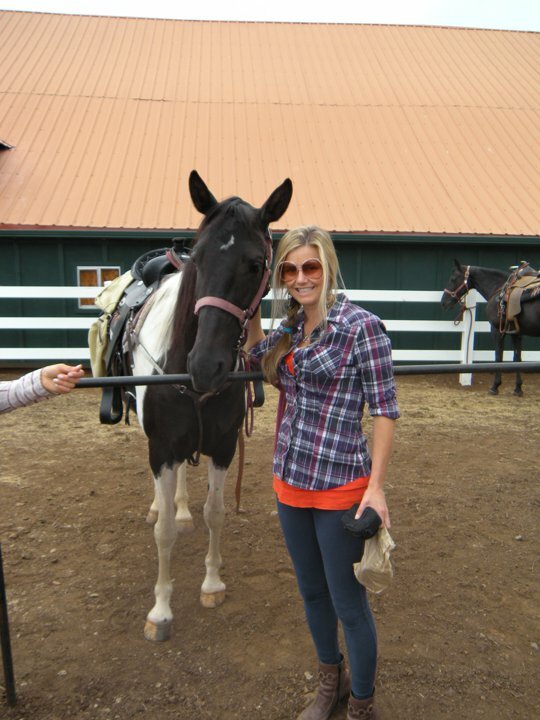 Equestrian Wine Tours is a full-service operation, and no experience is necessary to participate. The guides are eager and accommodating, and we all felt like we were in the best of (ranch) hands. Just make sure to come thirsty, and bring your closed-toed shoes and your camera (saddlebags are included). Kyle McNichols graduated from UC Santa Barbara with a degree in English and Art History. Her studies also include time at Cambridge University, but short of picking up phrases like “cheers” and an affinity for “a good curry,” the experience was more social than academic. She loves food and cooking though, so after working as a corporate copywriter and college counselor, Kyle initiated a cooking project called “Culinary Hopscotch” in 2010. 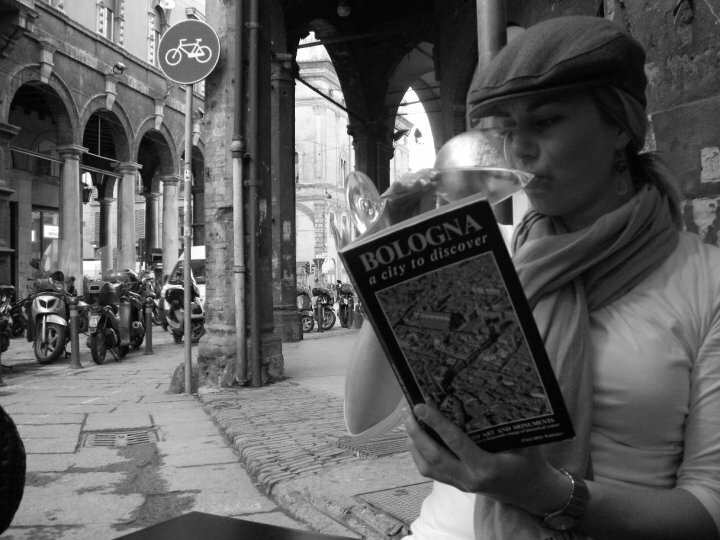 She traveled Europe with a carry-on suitcase and couchsurfed while taking cooking classes in various cities. 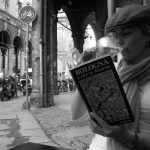 Kyle continues to take cooking classes when her travels take her to interesting places, and blogs about them. She recently relocated to Portland, Oregon from Southern California and is enjoying all of the food and wine related activities the city has to offer with her boyfriend—and her Newfoundland, Henri. Sounds like a lot of fun. We have wine tours by horse where I live, in Santa Barbara, but I have to admit that I’ve only toured the wine country in a personal car or limo. A cycling wine tour sounds more iffy to me than the equestrian option. It seems to me that if you’re cycling you run into the same problem as driving: operating a vehicle under the influence of alcohol. With horses, I assume they’re familiar with the route so they can more or less steer themselves.